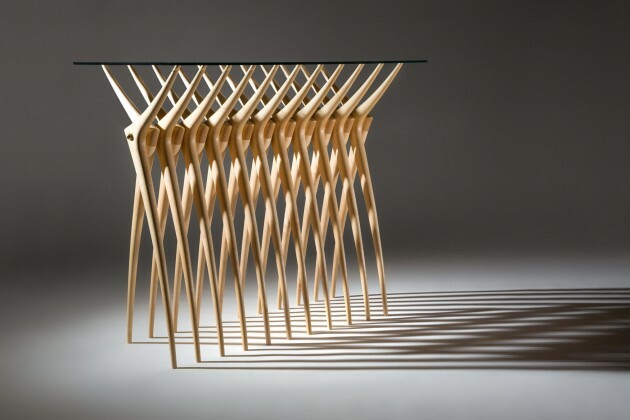 Irish furniture designer Martin Gallagher has created the Ardú console table, and will be exhibiting them at the Designers Block event in London this week. Inspired by skeletal structures, Ardú is a piece of sculptural craftsmanship. 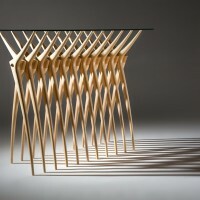 Repetition of form creates a rib – like formation resulting in a piece of intricate beauty. The sculptural elements reminiscent of delicate bones and brass spacers evocative of the human vertebrae, create division within the rhythmic pattern, in unison forming the structure of Ardú. 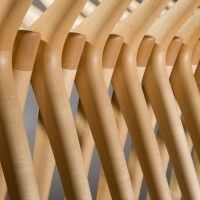 Maple was chosen due to its light delicate properties. 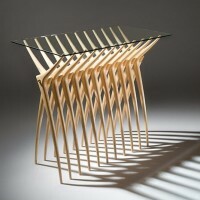 Glass was selected for the table top so visual connection with the configuration is maintained from all perspectives. Individual entities are combined to form one sculptural piece resulting in Ardú. 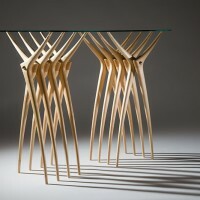 The overall length can be modified by adding or reducing the amount of legs for each table. Visit Martin Gallagher’s website – here.